Authorities investigated the shooting of two people in separate vehicles on the 210 Freeway in Rialto on Tuesday, March 14, 2017. 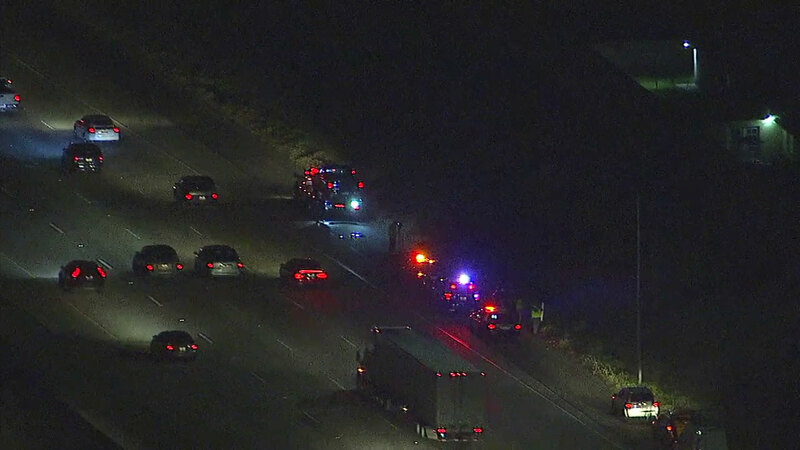 RIALTO, Calif. -- A suspect was on the loose after opening fire and injuring two people in separate cars traveling in each direction of the 210 Freeway in Rialto Tuesday night. Authorities said the first incident happened around 6:13 p.m. on the westbound side of the freeway between the Sierra and Adler avenues exit. The passenger in the car was shot in the upper leg. The person was hospitalized for non-life-threatening injuries. The suspect in this shooting was described as a man in his 30s with long brown or blonde hair. He had a mustache and goatee and was driving a dark gray or black newer sedan with light tinted windows. The second shooting happened on the eastbound side near the Cactus Avenue and Ayala Drive exits. The driver sustained a gunshot wound to the lower arm and was hospitalized for the non-life-threatening injuries. The suspect was described as a man between 40 to 50 years old with long dark hair up to his shoulders and a goatee. Police said he was driving an early 2000s dark gray sedan. It was unclear if the same suspect was involved in both shootings, but Rialto police believe it could be one person.